"Home of the Bourbon St. Burger"
This is the perfect burger hands down the bun to the patty, if you go here you should expect a crowd on Saturdays, but during the week it is pretty mellow and delivers rapidly. Not just your corner burger stand at all! Patricia: Bourbon bar on the West side of Green Bay has dollar burgers on Saturdays. There burgers are 1/4 lb. 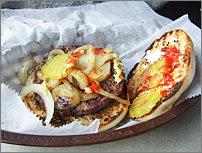 served on a dense buttered grilled bun with a pat of melting butter on top with dill pickles slices. I also ordered fried onions which were included in the price and they put a good amount on. The hamburger was large and nicely grilled. The beef patty tasted good but not as flavorable as some others I have tried. GreenBayNightLife Staff: This one was above par, a little buttery and perhaps a little greasier than some.